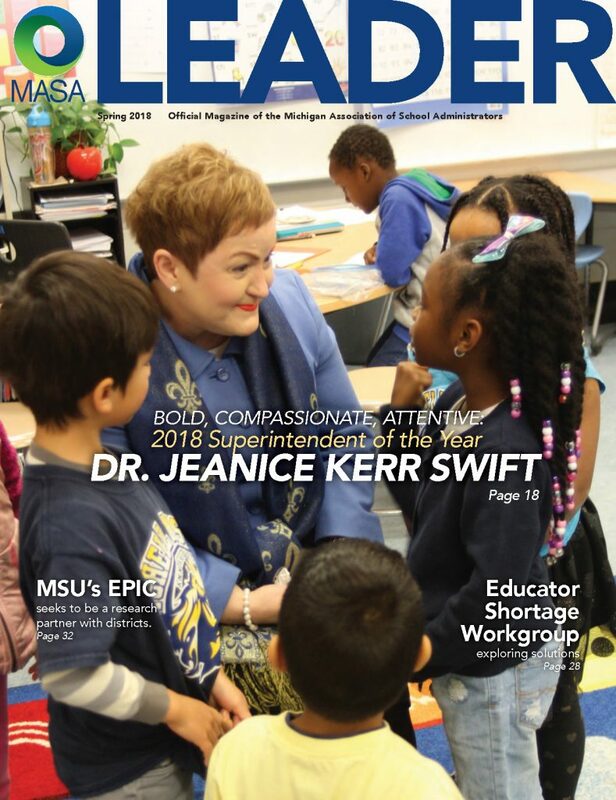 Bold, compassionate and attentive are three words used to describe the leadership style of Dr. Jeanice Kerr Swift, the superintendent of Ann Arbor Public Schools. Many of today’s challenges in public education are complex and require a dedicated and tireless advocate to ensure student success in school. In 2013, Ann Arbor Public Schools hired Dr. Swift as their district leader, and she used these leadership traits to tackle the many complex problems AAPS faced – and restored confidence in the community’s public schools. In 2018, the same three qualities earned Dr. Swift the title of MASA Superintendent of the Year, an award that recognizes an individual who has shown tremendous dedication to enriching the lives of children and has demonstrated effectiveness in maximizing their success in school and beyond. When she arrived in Ann Arbor, Dr. Swift quickly understood the importance that sharing AAPS’ community values would have on her success, and she embraced the fact that education was one of the top-shared community values. Specifically, she knew she would need to engage in strategic listening around what the community members felt needed attention, improvement or adjustment. Taking the superintendent helm, Dr. Swift’s 29 years of education experience as a classroom teacher, teacher coach, assistant principal, principal, district leader and assistant superintendent, guided her discovery of the culture and climate of AAPS, and how she could gather the community’s collective wisdom in order to turn the district around and move it forward. Dr. Swift began the process by adopting the World Café approach to structuring local community conversations, which included an aggressive plan to convene more than 90 meetings in the diverse district in a little over six months. At these meetings, participants were seated at tables and offered a question for discussion. Participants then moved to another table, and the answers to the discussion questions became a very deep, layered document of responses. Dr. Swift believes that the World Café process facilitated the critical part of the conversation, specifically the transformation of the activity of listening to producing the necessary community conversation process capable of moving the district forward. “We hoped that what emerged through the process of interaction was generative, even if it did not lead to an immediate resolution, that another set of ideas emerged or something new or different is created,” Swift said. Important to the process was the inclusion at the meetings of team members, such as building principals, teachers, central office staff and others. The University of Michigan was also included in the process with the purpose of assisting with gathering and analyzing the thousands of words of ideas and responses. AAPS was hoping to get a better view of what patterns emerged during the conversations, to assist moving from the gathering information phase to actionable processes. According to Michael Madison, principal at AAPS’s Dicken Elementary and president of the Ann Arbor Administrator’s Association, when Dr. Swift arrived as superintendent, the district was still reeling from a lack of communication, support, and trust from the previous administration. Enrollment was down, parents were pulling their kids out of the district, and the financial future looked very bleak. Dr. Swift put together an aggressive plan based on the community meetings to shore up the pieces AAPS stakeholders had clearly articulated needed immediate attention. One of the fundamental things that Dr. Swift learned during the Listen and Learn tour was the existence of real commonality of purpose within the district. She absorbed the simple truth that no matter where the parents came from within the district as far as diversity, socioeconomic status or neighborhood were concerned, everyone was in agreement that they wanted what was best for their children. The Listen and Learn Tour also reminded AAPS building administrators of the fact that district vision and purpose come from the values and aspirations a community has for its children. “In eliciting these [values and aspirations] during the tour, Dr. Swift empowered us to articulate our best ambitions for our community, our school district, and our students, uniting us to strive to achieve them,” said Chuck Hatt, principal at Burns Park Elementary. At the end of the process, AAPS created and distributed a report containing the recorded observations from the community, seeking further community feedback in order to develop it out to reach a more refined, finished state. The Listen and Learn tour was not a one-time event for AAPS, it has become an ongoing process. The process is a reminder to the community that the district is doing what they wanted them to do, that they carefully and thoughtfully listened and formulated a plan based on community desires. “We are updating and monitoring our progress as we go so that folks understand we didn’t forget and we are continuing the journey,” said Dr. Swift. “I think one of the rarest of skills in our country is the ability to really listen for understanding and then follow along a path of meeting the needs that come up through that conversation, and wrapping back to folks to say we heard you and here are the steps we’re taking to ensure that we are following through,” said Dr. Swift. The Listen and Learn Tour resulted in significant accomplishments in the district under Dr. Swift’s leadership, and specifically drove development in STEAM, International Baccalaureate, Early Childhood Education, and World Language programs. AAPS turned a traditional elementary school into a K-8 STEAM building. Enrollment went from below 50 percent capacity for a K-5 building, to an at-capacity K-8 building, even after adding additional classrooms and a new gym. Enrollment increased from 189 in Fall of 2013 to 606 in Fall 2017. To support curriculum improvements, AAPS also introduced Project Lead the Way into every grade level, at every building. AAPS now has a fully authorized International Baccalaureate (IB) program in an elementary, middle, and high school. The elementary originally was a facility below student capacity that is now full, even after a permanent expansion for the 2016-17 school year that included the addition of four modular classrooms on the campus for this school year. The IB middle and high school have also seen positive enrollment numbers in the 100s since 2013. In terms of early childhood education, the district has expanded its Young Fives offerings from about 30 students total, spread out in a couple of buildings in 2013, to 302 students in the current year housed in 20 classrooms spread out across 15 schools. Reflecting on the cultural diversity of the district community, they now offer seven World Languages: Arabic, Chinese, American Sign Language, Spanish, French, German, and Latin, with five of them offered through the AP level. Overall AAPS enrollment (not counting preschool) has grown from 16,449 in fall 2013 to 17,681 this fall, with an additional 459 kids in preschool programs. This year the district will use the Thoughtexchange online communication tool for the community to explore and share their thoughts on the district’s direction. This online mechanism allows the district to put out the questions to the community, gather the responses, compile those and distribute them back out to the community where they can be then “starred” based on how much the participants agree or disagree with them. Thoughtexchange creates an opportunity for everyone to see the feedback at the end collection time via a website, where it shows what all participants said. “To me, that is beautiful in regards to transparency – that everyone can see what everybody else is saying, and how popular some of the ideas were, and how some did not resonate with others,” Dr. Swift said. There will be challenge areas for the next round according to Dr. Swift, but she believes that it is enormously important to look to the community for suggestions on how to continue to successfully meet the community needs and thrive as a local district, despite facing the external challenges public schools everywhere are facing. Dr. Swift is using human interaction as a way of discovering the collective wisdom of her community, listening in order to build a stronger, vibrant Ann Arbor Public Schools. Mitch Smith is a communications specialist for MASA. Contact him at 517.327.9244 or mitchsmith@gomasa.org. Using seven design principles and a simple method, the World Café is a powerful social technology for engaging people in conversations that matter, offering an effective antidote to the fast-paced fragmentation and lack of connection in today’s world. Based on the understanding that conversation is the core process that drives personal, business, and organizational life, the World Café is more than a method, a process, or technique – it’s a way of thinking and being together sourced in a philosophy of conversational leadership. Find out more about conversational leadership here at www.theworldcafe.com.